Global TM search is conducted by the companies planning to export their services and products overseas. Both WIPO-Madrid System and USPTO facilitate trademark registration process and serve a database for global TM search. Primarily, the search permits international businesses to find existing international trademark database. However, it requires experienced professionals, access to trademark databases and a vast network of reliable foreign trademark agents. Word Search: This search uses classes 1-45 for both products and categories. It also considers phonetic similarities. Logo Search: This search is conducted using the database of Nice Classification which depends on the Nice Agreement. Device Mark Search: This search is conducted using the International Classification of Figurative Elements of Mark Database. It may be possible that a trademark one wishes to use, might be in use in a similar version by someone else. But, the trademark should not be similar as it may create confusion among customers which may lead to the case of infringement. So, to avoid such cases you need to do a thorough search of all the relevant databases using multiple combinations of search strings using both spelling and phonetics. To understand this you can consider an example of the search of the word “Region.” The search is incomplete without its multiple derivatives such as Regions, Region’s, Regional, and Regions’. The search must be also done considering possible spelling variants for a particular word. For instance, to, too, and two. While conducting Global TM search, the plural of a word should be also considered. Men can be Man. Homonyms must be also taken into consideration. For example, there, their and there are all similar sounding homonyms. For design marks “Design Phrases” or “design codes” should be used for conducting a search in databases for design searches. Global TM Search provides complete details about existing similar brand name or trademarks of foreign countries that are similar to yours. The search provides information about trademarks having different spellings but is phonetically equivalent to your brand name/trademark. It also provides information about any well-known marks having a similar brand name/trademark as of yours. Moreover, the search gives you a list of prohibited marks to help you check whether your chosen mark comes under the prohibited trademark list. It ensures whether your chosen mark is available internationally for registering as a trademark. 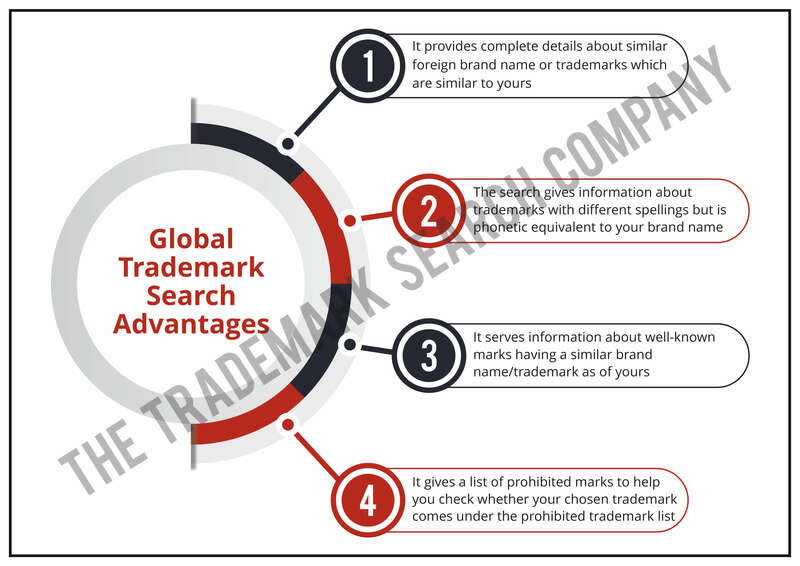 Global TM search provides a platform to compare your trademark globally as it gives you worldwide data. We offer customized and super easy Global Trademark Search solution to meet our clients need. Our experienced professionals aim to deliver comprehensive solution operating across multiple countries in different languages. Also, they have good expertise which helps our client focus on building the right brand. To know more, have a look at our Searching Services page. This entry was posted in Blog and tagged Global Trademark Search, TM Search, Trademark Search Company. Bookmark the permalink.